What formerly was a shrine devoted to a cult of assassins and their foul deity, now hosts an array of nasty gang members and their ogre boss. The complex itself is pretty straightforward and would be rather conservative in its own place. However, blending skeletal champions and remnants of the cult with the new gang-inhabitants makes the dungeon feel interesting and less predictable. 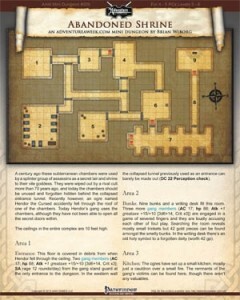 A simple haunt and a unique trap as well as modified equip for the hyperlinked stats render the mini-dungeon more diverse than the basic premise would lead you to believe. Brian Wiborg Mønster delivers an interesting little mini-dungeon, which, on paper, may look none too impressive. In play, the small dungeon felt more dynamic than I would have expected and the brief statblock modification shorthands render this one pretty much plug-and-play-ish, beyond even the other mini-dungeons. Still, this is, concept-wise, slightly less intriguing than similar installments in the series. My final verdict hence will clock in at 3.5 stars, rounded up to 4 for the purpose of this platform.